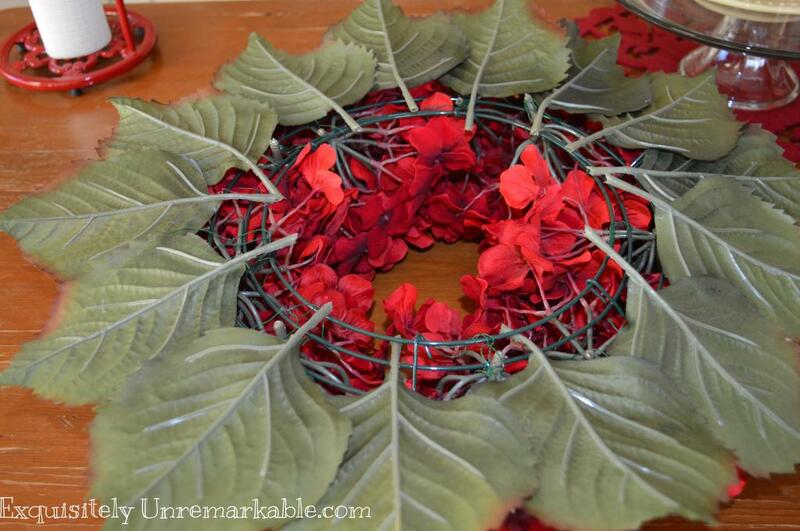 Make a stunning DIY red hydrangea wreath, or your own color of choice, in just minutes with this quick tutorial. My home is a very old beach cottage. It is lovely, but not large and when we moved in it was necessary to add a kitchen as the existing one was not functional...at all. I spent hours upon hours pouring over design books and magazines trying to figure out exactly what I wanted. One day, I opened the Kraftmaid catalog, saw a kitchen with a custom hood and that was it. I was in love and I had to have one. I designed the whole kitchen around that hood, it drove the Home Depot kitchen consultant crazy. While the mahogany countertops and farmhouse sink (that I eventually got. Well, sort of...) may have been axed along the way, I would not budge when it came to that hood. It has been the very lovely focal point of my favorite room for over a decade now and I cannot imagine my kitchen without it. Of course, a fabulous hood, requires a fabulous ornament. 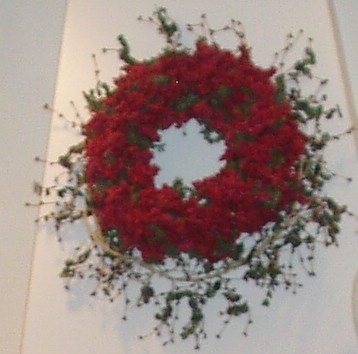 The first wreath I had up there was made of red berries. Feeling that it was lacking something, I wrapped another berry garland around the outside of it to add fullness and some size. The picture is terrible, but it really was a great look for a long time. However, after several seasons of Bravo's Flipping Out, I felt the need for a cleaner, sleeker look a la Jeff Lewis and the wreath needed to go. It had also seen its day, ten years is a long time for any fake flowers to be hanging around. This was my old wreath ~ be nice, it was from my mom. Now, before I am asked why I didn't use real hydrangeas for this project, I will tell you. I like quick and easy projects. I am lazy and impatient (hydrangeas require drying and then I would have to spray them red, blah, blah). I just wanted to buy the flowers and have my new wreath done by dinner. So off to the craft store I went, 40% off coupon in hand. I think it's a some sort of disease, but I just can't seem to buy anything unless it's on sale. I picked up a green wire frame, several hydrangea stems and floral wire. 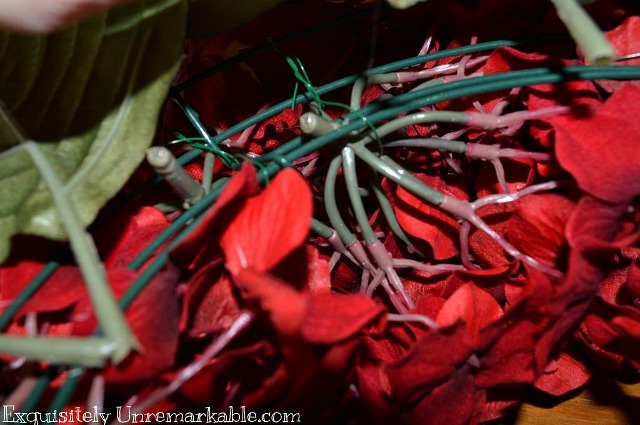 I cut each wire stem about an inch from the flower and tied it to the frame with floral wire. I pushed the flowers very close to one another to achieve a full look. I knew that I wanted a sleek, one colored wreath, but I also knew it needed some kind of a border to highlight the red and look finished. So I removed the leaves from the now flowerless stems and I glued them to one another in a circle around the whole wreath. 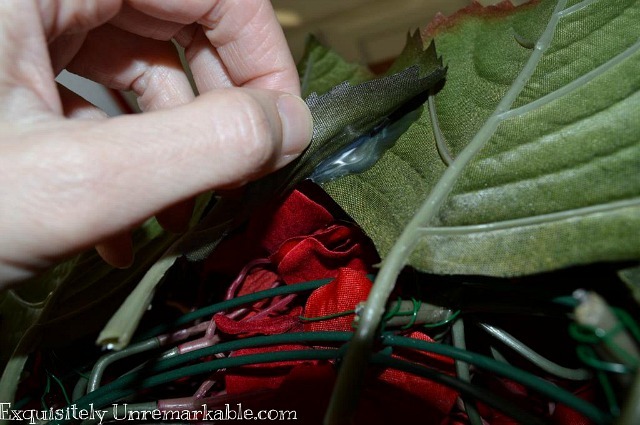 In some spots I glued them to the flowers as well to make sure everything was set and super secure. When the wreath was complete, I double checked all my glue and wires to make sure that nothing needed reinforcement. This is how the backside of the completed wreath looked when I was finished with all the wiring and gluing. I have to say that the attention detail paid off, because now, more than five years later it still looks fabulous and is still totally intact. 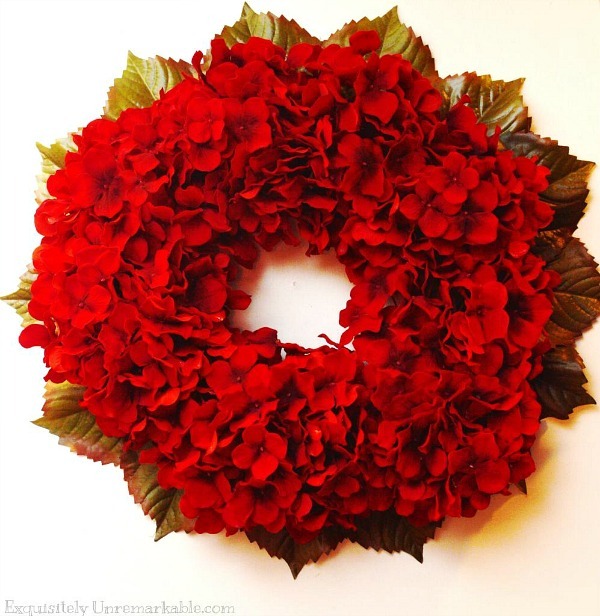 My red hydrangea wreath, although very basic in design, provides a dramatic, romantic accent to the hood, drawing the eye upward as it provides a pop of color to an otherwise serene palette. I have to say that I really love it. 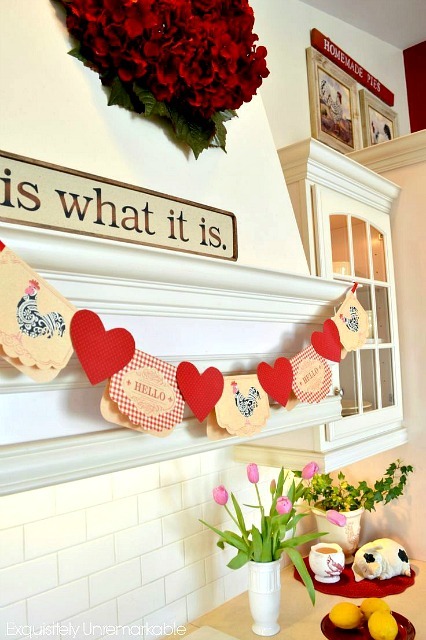 Over the years it has provided a very simple, but elegant backdrop for whatever holiday or season I dress my kitchen for...like Valentine's Day when I add colorful banners. I mean after all, is there any better holiday to showcase all that red? So what do you think of my wreath? Is this one too simple for your taste? 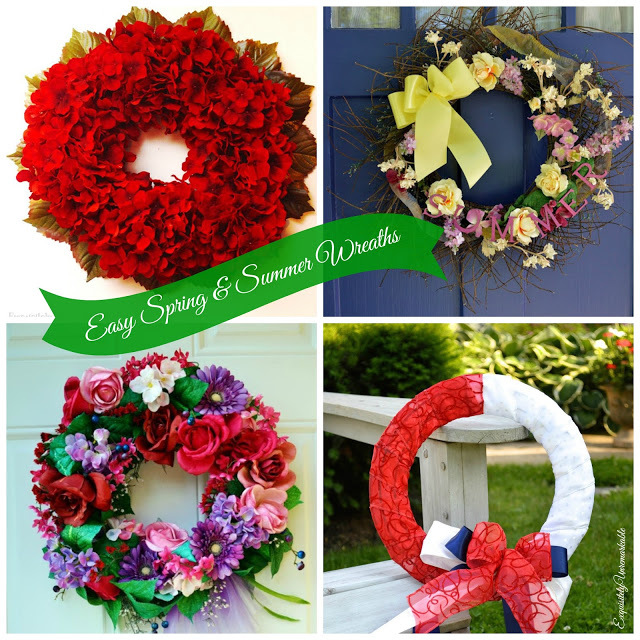 Looking for more easy DIY wreaths? Check out this post. Want to see how I dressed that hood for Easter? I think the wreath is perfect - can you make me one in blue please? The wreath is beautiful. I am going to try and make one for my front door to use between the holidays and Easter. I think it is simplicity at it's best. It's beautiful. Thank you, so much all!! Hey Kim! NO it is NOT boring! It's beautiful! I love your kitchen and that pop of red really looks super good and shocking - in a good way. :-) I love it! I also love that you had it done by dinner, and you probably would have paid a good chunk of change if you bought a wreath in a store. Nice decorative project; I hope to someday make my own. It's so easy Beth! Have fun! Thanks Jules! Yea, I am way to cheap to buy one~ those wreaths can get very pricey! Thanks for popping by to leave a comment! 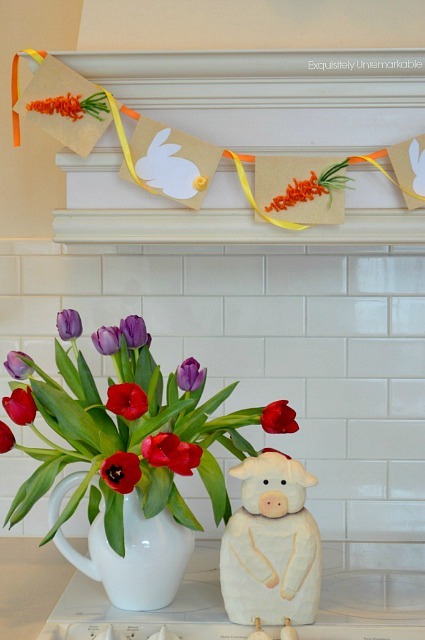 Love your kitchen, and the wreath is perfect! Your kitchen is so neat and organized. Lovely, magazine-ready photo! Wow~magazine ready! Great compliment! Thanks Tracy! Thanks so much for visiting my blog. Your wreath is beautiful. I'm your newest follower and I think I got all your routes so I don't miss anything. I hope you will follow me also. Please come by and add you links to my blog hop that is going on now. 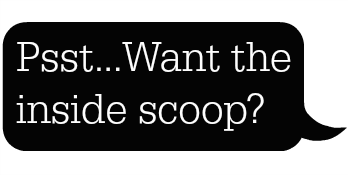 It's unlimited links to help increase blog intros for everyone. Thanks for stopping by! Thank you for the follow and the party invite, it was my pleasure to follow you back! I added two links to your hop, this wreath and a funny story! I hope you enjoy your weekend! Thanks Cindy! It's always nice to hear! Enjoy the weekend! Thanks Ellie, I always find some great stuff to pin! :) Have a great weekend! You have a beautiful kitchen and the wreath turned out beautiful. I like the pop of color.. Thanks so much Priyam, I do like color! Thanks Jenna. It was nice of you to pop by and check it out! Love your blog! I love it. I've got to make one! Go for it! The drive to buy the supplies was the longest part of the process! Good Afternoon Kim, Your wreath is lovely and it stands out against your lovely white kitchen. Sometimes we need immediate gratification and this beautiful wreath certainly fits the bill. I love how you have added red chairs to your kitchen table. I have red in my kitchen and it always makes me happy. Kim, I have enjoyed my visit to your blog and so I have become a new follower. Thanks Angela! Thanks for hosting as well! Love your blog! Thanks again Heather! Your parties are always filled with inspiration, that's for sure! I'm so glad you liked the wreath! I am a sucker for red for sure! Thanks for popping by! The white is fresh and clean AND versatile! Send me a picture! I would love to see it in a different color, Vonda! Thanks Angela, I loved the idea of just using one flower and keeping it simple. I think it works! Thanks for taking the time to comment! What a beautiful wreath! And I love your kitchen! Thanks Sharon! I'm glad you popped by to check it out! I hope you come back to visit again soon! have a great weekend. I am visiting from your feature from On Sutton Place and I think your wreath is stunning in its simplicity! I use red on my front porch and I may have to do something like this. I hate to admit this, but Easter eggs are still in the grapevine wreath around my front door! Oh, and I love your kitchen and that gorgeous hood! Haha! Jane, between the yucky weather and the end of the school year, I still have that same wreath (mine has blue robin's eggs) on my door, too! I even wrote a post about what a faux pas that is ~ I am violating my own decorating rules! Thank you for your lovely comments regarding the wreath, my kitchen and the hood. You made my day! The wreath adds a nice touch to your fabulous kitchen. Thanks so much! I do enjoy looking at it, when I am sitting in my kitchen! This is so pretty! It really adds a beautiful pop of color to your kitchen! Thanks so much for sharing at our Get Your DIY on Party! 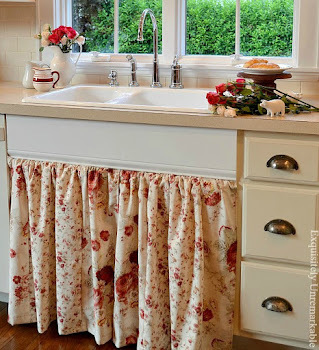 Next week’s theme is Thrifty Upcycles, I hope you can share with us again! It all starts Sunday at 7:00 est! You know, this wreath could also double as a candle ring on your holiday table. It would take a big candle, but oh what a statement it would make. I love your wreath! And the red is perfect. I use that as an accent in my Paris themed kitchen. Thanks for sharing! Rebecca, I never thought of that! I do have a large glass hurricane and I bet it would look fab sitting in the middle of that wreath on my holiday table! Thanks for sharing your inspiration! Thanks for the nice comments about my wreath, today. So here I am, looking you up and ... I like it here! The wreath is nice too. Thanks Jen! Your comment just made my morning! :) Thanks for hosting! What a great party idea, love it! I love it too. Your wreath is beautiful! I think I would love anything that is called "Hydrangea"...and I happen to really like single bloom wreaths and even bouquets with only one kind of flower- May I say "Classy"...yes that's what I think! Thank you, Jonell! This is one of my favorite projects. It's the focal point of my kitchen....and "Classy" is the ultimate compliment! Just beautiful! I have pinned this to my Wreath board and will be sharing over at FB and Twitter. I would love it if you could stop by and share this at Celebrate it Sunday. The party stays open until Saturday! Happy Fall! Great red accent. Rich and vibrant and really pops with the white. Definetly draws the eye upward. The red chairs are a good focal point also and ties everything together! Great job! Thanks Lynn. I love this wreath. It’s very simple, but it gets the job done! ;) Plus it was super easy to make!! Thanks so much for coming by and sharing your beautiful wreath, I featured it this week! I hope you will stop by and share something again on Saturday night! Love the wreath & your kitchen..Your directions didn't say how many hydrangea stems you used - it take it the wire frame was a 12"? So lovely, looks amazing in your kitchen. Thanks Robin, it was an easy one to make! I think your wreath is beautiful. I have burgundy accents in my dining room and I am going to make a wreath like this for the short wall next to the sliding glass door. It will be perfect. Thank you so much for this idea. 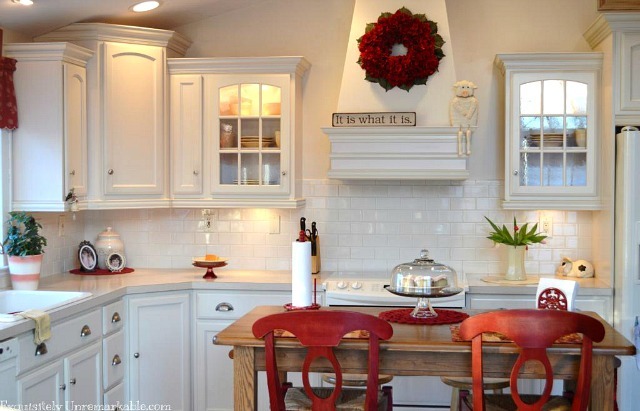 I love that bright red wreath and the white cabinets. Beautiful. Great, Susan!! I am sure it will be beautiful! Love this! It is on my list to make this year!! Thanks Jeannie! I bet it will be gorgeous and it's so easy! It may have been three years since you made the hydrangea wreath, but it is still in style. I love simple but chic! I admire it everytime I spot it on a blog post. I love wreaths and I have one on the back door, front door, and my basement door which opens on the side of the house at ground level and can be seen from the street. I also put one, sometimes, on the inside of my front door where it can be seen from the living room and dining area, and I often hang on on the wall in a bedroom or two. I just love all the possibilities! Your wreath is a "forever wreath!" Thanks for getting my creative juices flowing. Red is one of my favorite colors but may try a yellow one for Spring. Beautiful and totally agree that adding the leaves gives it that designers' finishing touch. Amazing!!! My daughter and I are going to try this for christmas and maybe get some small ornaments to put on it and pinecones. Sounds lovely! Thanks so much for letting me know you are going to try to make one. I hope you come back to visit again soon! Thanks Rhonda! It's my all time favorite wreath! Its such a gorgeous color, its something that can be used many times over. I love it. Thank you, Maria!! I do love the bold color. It's become my favorite accessory.